A few months ago, I was in Nashville for the Blissdom Blogging Conference and I had the privilege to sit in on a focus group for Freschetta Pizza, where we tasted every variety that they offered, such as BBQ Chicken, Vegetable Medley, Chicken, Spinach & Mushroom and even Six Cheese Medley, as well as introducing me to the concept of FRESCHETTA® By the Slice. This hour was an interesting time looking at their desire to not just offer a good pizza, but one that really focuses on quality, taste and quite frankly, a gourmet twist. They wanted our honest opinions, and took into account all of our feedback. I was shocked that some of the women in the group refuse to eat frozen pizza. They had a preconceived notion that it tasted like card board. They had not tried Freschetta because it really is like homemade. Freshetta’s Pizza by the Slice is a great option for those on the run, or even those attempting to curb the calories. I didn’t think it was possible to pop a piece of pizza in the microwave and still have it taste excellent, but this does. It’s a great option for lunches, or in our case, snacks on the go. One of my honest assessments to the Freschetta staff was that I purchase frozen pizza based on sales, coupons and taste. I shared that value is extremely important to me as I feed a family on a budget. I love that they listened. Check out Freschetta’s Facebook page, “like” them, and click on the coupon tab. You’ll be able to print a coupon for $2 off, plus, they are always giving a heads up to additional savings, and more coupons. 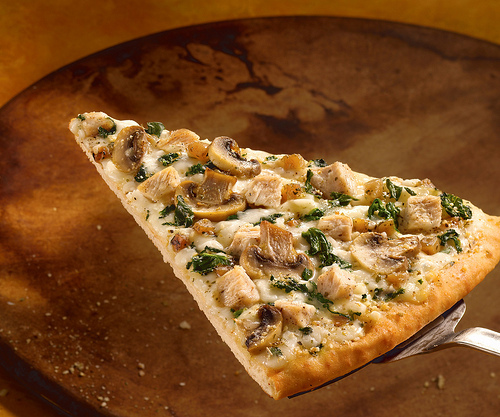 Well, all this talk about pizza is making me hungry. It’s on sale this week at my local grocery store, so I think I might just be enjoying a fabulous tasting, yet quick and easy meal for dinner tonight.